Black silk satin-back crepe; low waist, straight silhouette; creative use of different textures of fabric; ribbon decoration. 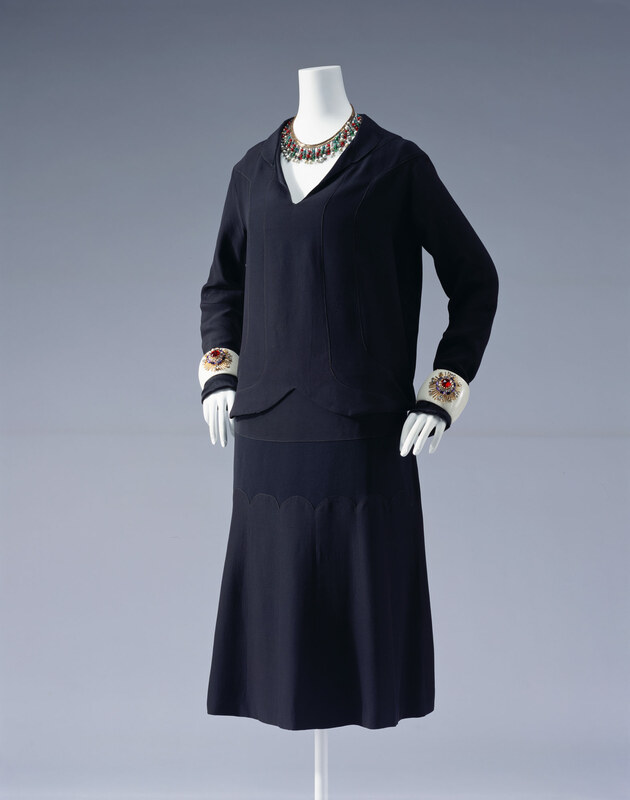 This is one example of Gabrielle Chanel's "Petite Robe Noir," a simple knee-length black dress. "Vogue (U.S.A.)" described the "Petite Robe Noir" in its November 1926 issue as the "uniform of the modern woman," refering it to the black car, which was the only model marketed when Ford started the full-scale mass production of cars. Since then this style has become like a byword for Chanel. After World War I (1914-1918), society was greatly transformed, partly because of the rise of the middle-class and the introduction of full-scale mass-production. At that time women's social independence progressed remarkably. Women in the new age led new fashions including suntans and short hair. They also required functional dresses that matched their active life styles. What they wanted was realized by Chanel and Madeleine Vionnet in the form of simple knee-length dresses with straight lines and no decorations. Black was highlighted as a modern color, although it had formerly been used for shop clerks' modest uniforms and mourning dress.